Help us show the world that Fluevog fans are some of the most talented people on the planet! 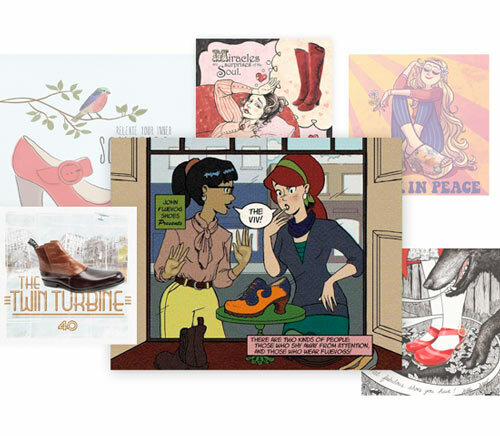 If your ad wins, you’ll receive a gift certificate for $1000 to John Fluevog Shoes, a bio on FluevogCreative, and your artwork, name, and URL will be put in front of thousands of people via a selection of superior magazines. Sign up to submit your artwork and view all of your past submissions. Click on the Tool Kit and get those creative juices flowing. Submit your artwork for the whole world to see! John chooses the brief’s Finalists and then your fellow Fluevogers decide who wins. Be a part of the greatest Fluevocratic Movement in history by voting for your favourite Fluevog Creative Finalist! Help John decide by perusing the Gallery and giving some “thumbs up”. John chooses the Finalists for each Ad Brief. When the polls close, we will obey your thunderous, collective voice.